This is the musical organ grinder: I was disappointed there was no monkey, but his dog was very cute. 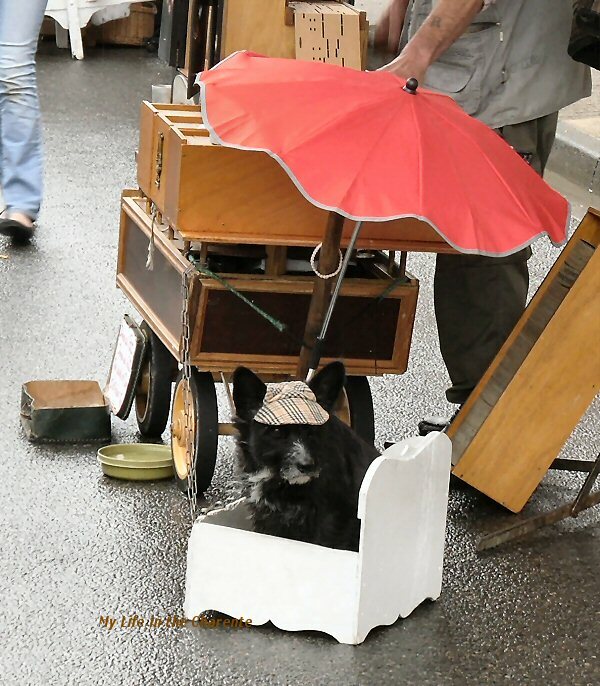 Note the cap, his bed and his very own umbrella. 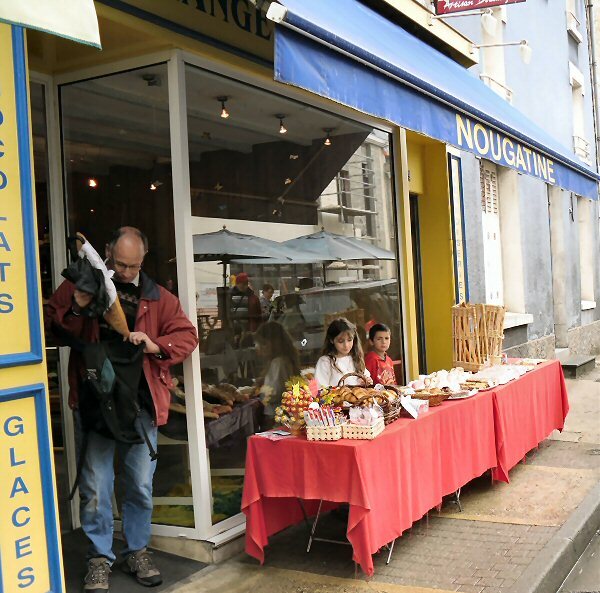 The Boulangerie; even the children do their bit selling the small cakes outside the shop. A table full of second hand junk! Umbrellas up and raincoats on. 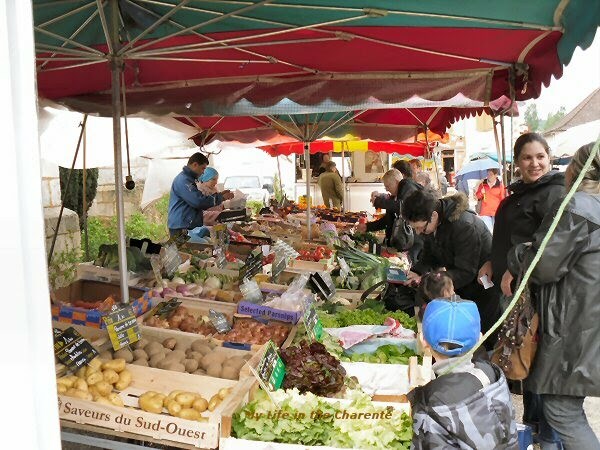 Vegetables are part of the normal Saturday morning market. The oyster stall - my favourite; take your pick of various sizes. 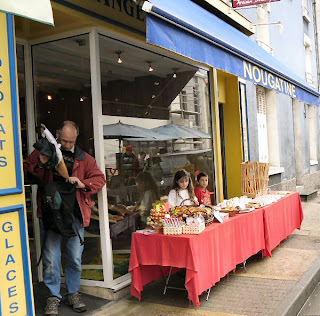 I bought une douzaine (a baker's dozen-13) for the princely sum of €3; sorry Nigel but I could not resist them. A damp looking fun fair under cover waiting for the evening. Public Holiday - May 8th - WWII Victory Day (1945). Commemoration of the end of the Second World War (in Europe). Ceremonies take place to remember the soldiers killed during the war. Wreaths are placed on the tomb of the unknown soldier, at the base of the Arc de Triomphe in Paris and at monuments to the dead of the war, throughout France. 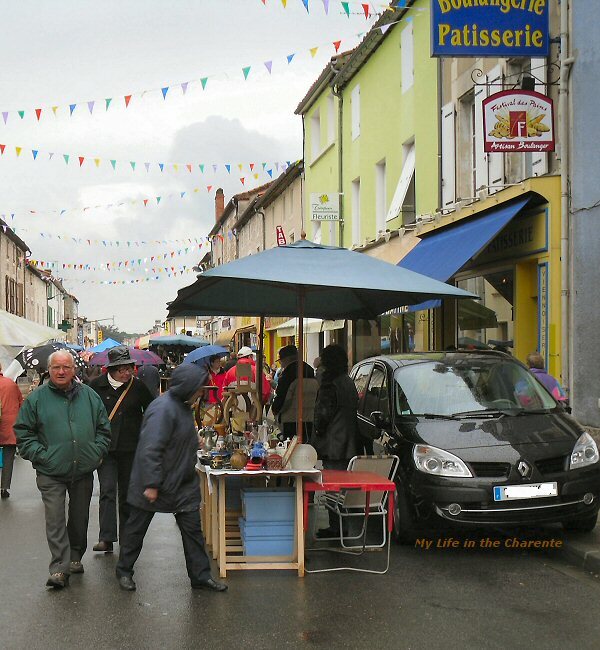 On this public holiday, Chasseneuil sur Bonnieure also celebrated the opening of the new bypass in 2005. Before this, the main road N141 through the town was the only road for all vehicles, regardless of size, to travel from Limoges to Angouleme. It must have been a nightmare as the road is not very wide. For their celebration, they close the road through the town and have what they call a Bric a Brac sale. This means if you pay a small price for a place to put your table, you can sell anything you like. I have to admit there is an awful lot of junk on sale, but junk to one person is something useful for another. 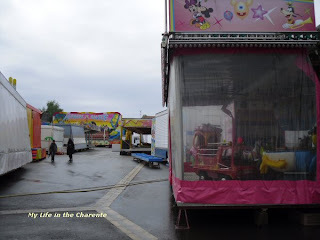 In the evening, they have a fun fair for the children, and I am sure, some of the young at heart adults as well. Celebrations of different kinds continue through the weekend. Sadly, the weather was not at its best in the morning, and although not really raining, it was damp with odd bits of drizzle coming down. It cleared up later, so I am sure the fun fair did well in the evening. The following pictures were all taken on the morning of the 8th in Chasseneuil. 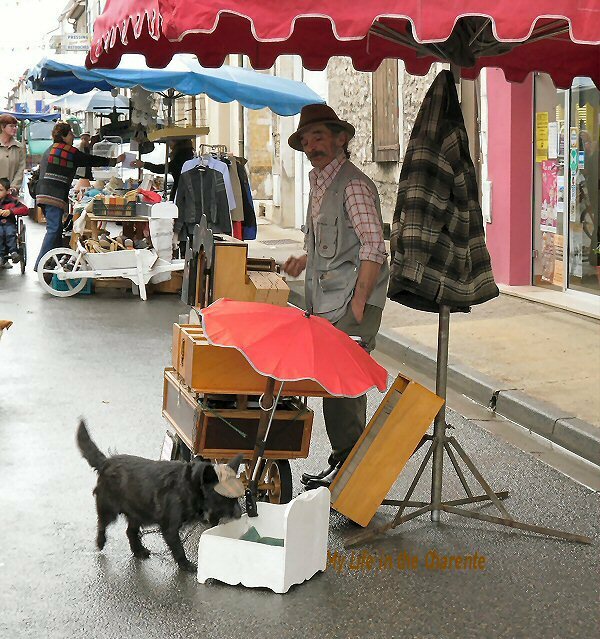 No monkey at the organ grinder's cart! How sad. But your right the dog is cute. Wet weather or not, it looked like a fun place to be! There are things like this here, too. 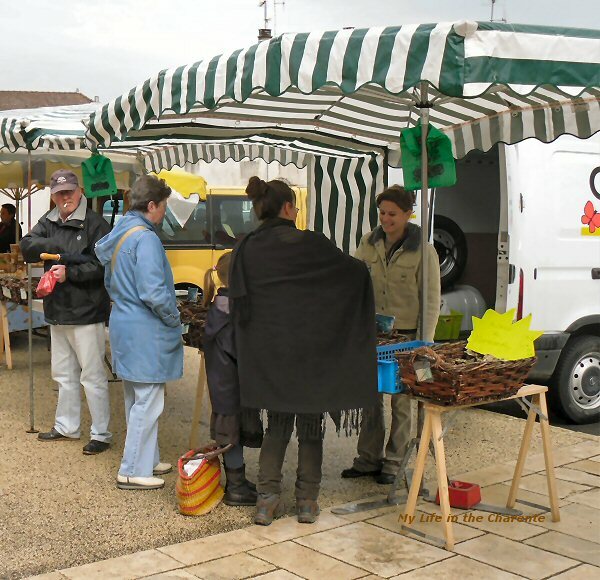 We have "flea markets", where people rent tables and sell anything and everything. There are also city-wide or roadside tag sales in various places! I hope you enjoyed your oysters! The weather here is mess up too. Looks like it could have been a great day. It's been raining so much here in Oregon. Our Famers Market just opened last weekend - I am looking forward to fresh, local, and organic veggies! Look at the dog. He's got it good. Love the photos as you walked through town. Looks like the kind of thing we have here in certain areas on occasion. Just lovely ! It's another world to mine, everything looks so different & I really enjoyed this post today, seeing a bit of France as I have never been (but hope to maybe when I visit the UK next.) Thanks for the great photos ! That doggy is soooo cute!